A wedding ceremony can take many forms, which can be very formal or equally informal and all kinds of ‘shades’ in between. For example a wedding taking place in a castle is going to be very different from one on a Caribbean beach with no guests or one taking place in your back garden. 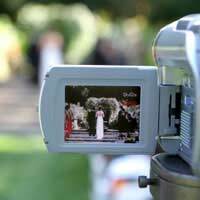 Therefore, before you even plan a wedding video, you need to understand the format and the environment in which it’s occurring. Whilst all couples will want their wedding video to be the best it can possibly be, the decision as to how it is approached will usually boil down to considerations such as production quality v budget, equipment available, logistics and the producer’s experience. It’s natural that two cameras are better than one, especially for a wedding video, as things often happen in more than one place at the same time over the course of a wedding day which are equally as important to capture, yet not necessarily occurring in exactly the same precise location at the same time. If there’s only one person filming, you could still have 2 cameras – one manned and one set to record automatically. Examples of this might include in the church where you, as the cameraperson, could be taking shots of the groom and best man reacting to the arrival of the bridal procession, which could be shot by the unmanned camera. And, during the evening reception, you could have the unmanned camera filming the dance floor, leaving you free to roam around the hall shooting other scenes, candid shots, close ups of the bride and groom, interviewed comments from other guests etc. If the budget allowed, you could even have 2 manned cameras and one unmanned which would usually cover most eventualities. However, as all of the footage needs to be edited together later, it’s crucial that you have 3 cameras, which are exactly the same. This just doesn’t mean the same brand but the same model too as cameras often have a different hue which would be noticeable when you come to editing all of the footage together later. Audio plays an important part in a wedding video and it’s a good idea to have more than one source for recording sound as entire audio tracks can be ruined by things like interference noise, such as a humming sound on the track, or by things like wind. Radio lapel microphones are fantastic for capturing the main important audio features such as the bride and groom exchanging their vows or the best man’s speech, although it’s harder to achieve with the bride as it’s much more difficult to conceal the microphone if they’re wearing a traditional wedding dress. Another option to ensure you get the best sound quality for the main participants is for the groom to carry a microphone attached to a minidisc recorder concealed in his pocket. For general audio quality throughout the day, however, a directional microphone is better than an omni-directional one as the latter will inevitably pick up a lot of extraneous noise. For most weddings, you’re not going to have much control over the lighting arrangements, yet it’s important to find out what kind of lighting you’re going to have to contend with before the ceremony and it’s useful to visit both the wedding and reception venues to determine any problems you may face before the day of the event. Reception venues in the evening can be notoriously tricky as they are often dimly lit to add to the ambience and atmosphere, so it’s important that you use a camcorder that handles low lighting well. You should be in regular contact with the bride and groom several weeks prior to the wedding to establish which events you need to attend. For example, some couples like the bride’s make up and preparations on the day of the wedding filmed, as well as the drive to the ceremony, post-wedding photo shoot, reception etc. You should create an events and times schedule and ask the wedding party to keep you informed of any changes to this. Also, you need to ask the bride or groom how intrusive they’ll allow you to be. It’s their big day after all and, although you could film much better material if you’re allowed to get close up all the time to ask guests questions in order to obtain ‘sound bites’ etc., some couples might find that too intense, which could result in you annoying or upsetting them, or any of their guests, so do find out how they want you to film and how involved they want you to be. Some couples arrange to have a wedding planner to help with all this so it’s useful to get to know them to get all these issues ironed out if someone has taken on this role. Because you won’t want to miss any of the action, and the fact that you’ll end up with lots of footage, in-camera editing is really not an option at weddings and it should all be done later. Chances are you may get asked to produce two versions – a short one of perhaps 15 minutes or so which are the best highlights for the couple to show guests and then another longer one, which might span an hour or more for the couple themselves to keep. In this day and age of sharing your memories over the internet, you may even get asked to create a version which is just a 2 or 3 minute clip which a couple can post onto their own wedding website to share with friends. Special effects, incorporating things like slow motion with mellow music, soft-filters and sepia tones, often work very well in wedding videos but you shouldn’t try to overdo the effects too much. Speeches can also be rather long so you should consult with the bride or groom to establish how much you’re allowed to cut if you’re faced with a really rambling speech.